Vogue Knitting Spring 2016 Prism Yarns Shades Blue Wrap Kit Available Now! A new beautiful wrap kit is available from our friends at Prism Yarn. 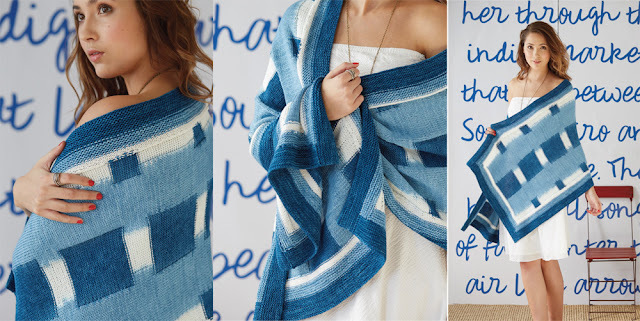 Meet the Shades Blue Wrap Kit made from Prism's beautiful hand-dyed Tencel Tape yarn. Shawl pattern is featured in the Vogue Knitting Spring 2016 issue. Prism Yarn Tencel Tape yarn is a 100% tencel knitting yarn. The colors are saturated and exquisite, the hand is silky smooth and soft, there is superior drape and Tencel is highly eco-friendly. Made from sustainable trees, Tencel has far more moisture absorbing capability than cotton, takes dye beautifully resulting in much less dye usage, and is hypo-allergenic and breathable. The knitted construction leads to a durable yarn with lovely stitch definition. The yarn kit for this beautiful wrap is available in the Blue shades as shown, as well as Sage, Peach, Plum, Grays and Sea Greens. Order your favorite color today and soon you will be knitting your new favorite wrap to wear for Spring!